In an effort to visit this spot at least once a week, I want to share with you one of my favorite library finds. This past Thanksgiving, I contemplated whether or not my eight-year-old son was ready to partake in the listening of "Alice's Restaurant Massacree" (commonly called "Alice's Restaurant"), a Streetman family tradition since the beginning of time. I forgot to actually get the old record player cranked up, but regardless, seeing as I found this fabulous semi-nonfiction book in the children's section of the library where I work, the decision has been made. He's definitely ready! 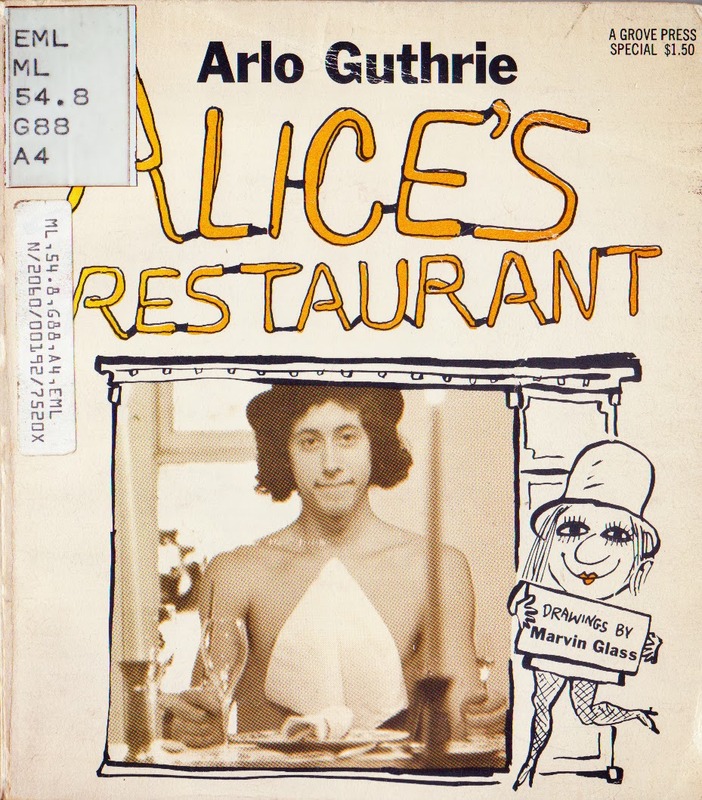 As most of you kids born to the baby boomer generation know "Alice's Restaurant Massacree" is a song/ spoken word extravaganza written by Arlo Guthrie (son of famed folk singer Woody and a hippy-era legend in his own right) that was eventually made into a full length feature film staring Arlo himself. The story told within the song is loosely based on true events that happened to Arlo surrounding a Thanksgiving feast at his friend Alice's church/house in 1965 and involves a rather complicated case of arrest due to littering. This song is called "Alice's Restaurant." It's about Alice, and the restaurant, but "Alice's Restaurant" is not the name of the restaurant, that's just the name of the song. That's why I call the song "Alice's Restaurant." The basic premise is that Arlo and his buddy go visit Alice for Thanksgiving and arrive at her house (which is an old church) only to find that Alice has a habit of letting the garbage pile up. 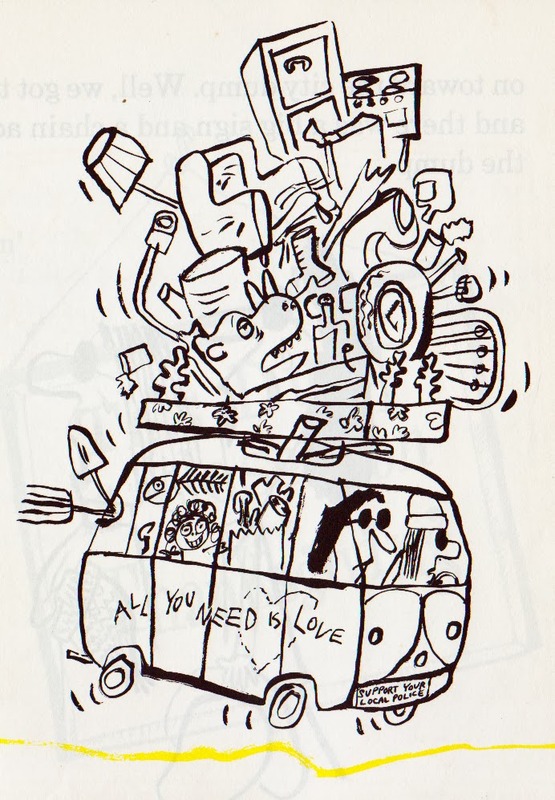 In a friendly gesture, the two load the "half-a-ton" of garbage into their "red VW microbus with the shovels and rakes and implements of destruction" on top and take it to the dump only to discover that the dump is closed on Thanksgiving. 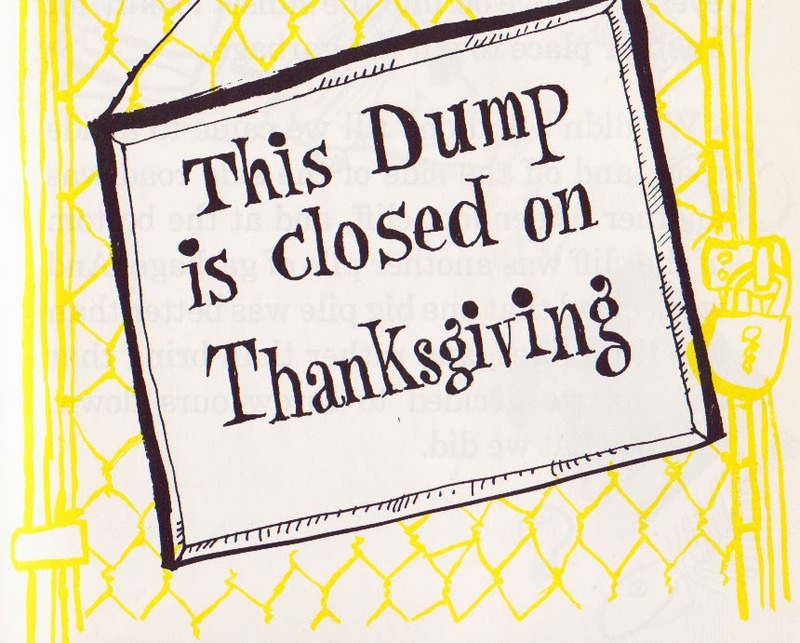 We'd never heard of a dump closed on Thanksgiving before, and with tears in our eyes, we drove off into the sunset lookin' for another place to put the garbage. We didn't find one 'til we came to a side road, and off the side of the side road was a fifteen-foot cliff, and at the bottom of the cliff was another pile of garbage. And we decided that one big pile was better than two little piles, and rather than bring that one up, we decided to throw ours down. This unfortunate event leads to an arrest and turns into one of the greatest songs sung by anyone, ever. It is a story about friendship. Kinda. More really about the Vietnam draft. It is anti-war and pro-people. It stars the unforgettable Officer Obie and a cast of other characters that entertain, educate, and delight. This song is one of those things in the world that reminds you how awesome people can be. 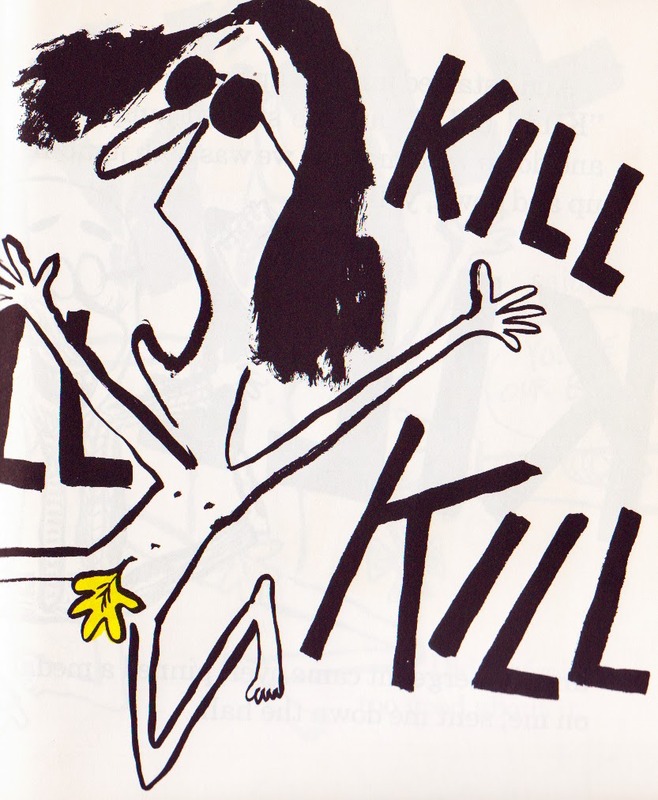 So let's just say that I was beyond the moon psyched to discover a book version of this ditty existed. 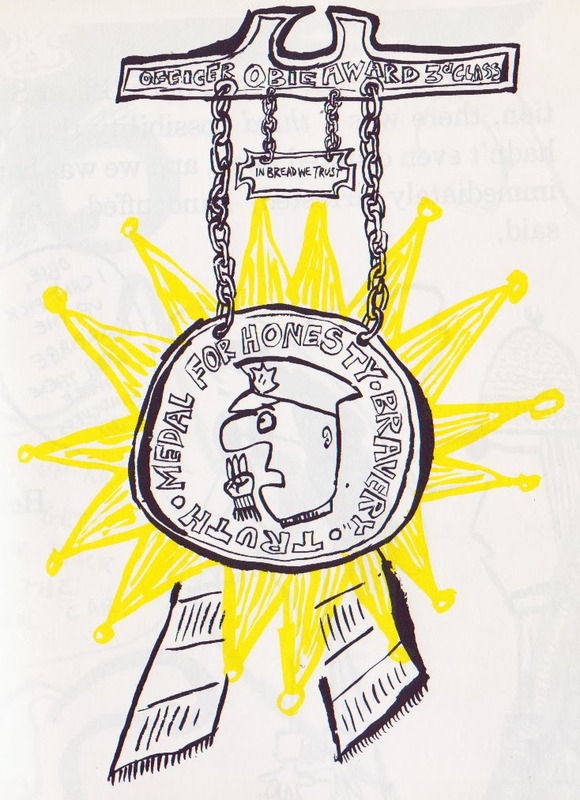 I couldn't find anything on the illustrator (unless he is or was related to one of the greatest toy designers OF ALL TIME... Lite Bright, Mouse Trap, Rock'Em Sock'Em Robots and THE INCH WORM? Yes? No? Anyone? Anyone?) 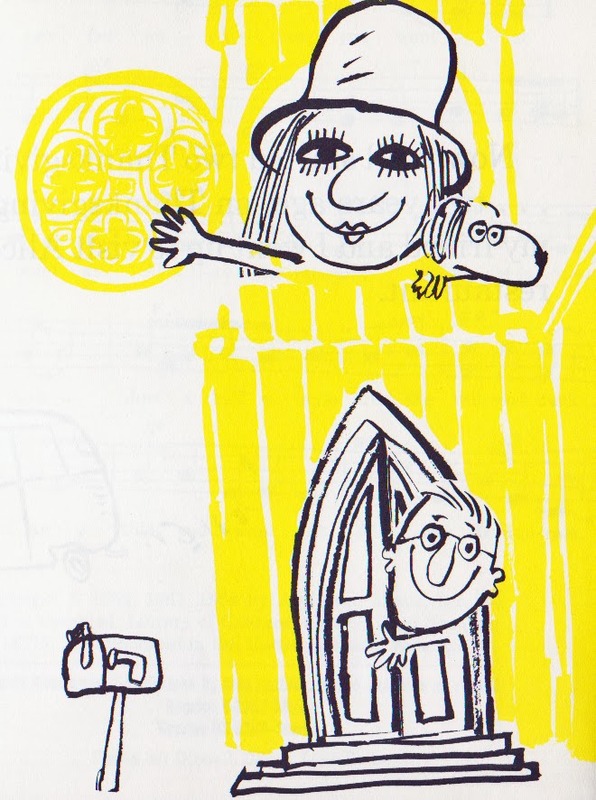 Regardless of who he was, the simple black and yellow illustrations are perfect for the tale. Whimsical and completely silly in a way over the top way. Anywho... the existence of this book is way, way, way super cool in my book. If for some reason you've never heard of "Alice's Restaurant" (and aren't particularly prissy), take a seat on the "group W bench" and listen up and.... you're welcome.